Not all dinosaurs were gigantic. Just like today’s animals they evolved into a range of sizes, but the largest animals to ever live on land were dinosaurs. The largest of the dinosaurs were four-legged giants known collectively as Sauropods. They had long necks and tails with four elephant-like legs. In general the largest Sauropods were about 10 times the mass of the largest living animal - the African Elephant. Many measured from 20 to 25 metres long, stood 10 to 15 metres tall and are estimated to have weighed 80-100 tonnes. Among the best known members of this group are Brachiosaurus, Diplodocus and Apatosaurus (formally known as Brontosaurus). 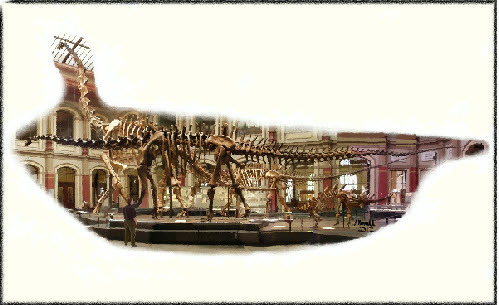 Some of the newer species are Supersaurus (possibily a larger relative to Apatosaurus), Antarctosaurus, and Ultrasaurus. At the top of the food chain were the carnivorous dinosaurs. Perhaps the best known of these is Tyrannosaur rex. This was a bipedal animal with a mass similar to an elephant. Its forelimbs had reduced down in size until they were almost useless. Some other dinosaur carnivores are Allosaurus and the recently discovered Giganotosaurus which is even larger than Tyrannosaur rex. In the skies flew the largest flying animals the world has ever known - the Pterosaurs. One Pterosaur, Quetzalcoatlus, had an enormous wingspan estimated at 10 to 13 metres which is larger than some private aircraft. The Pterosaurs had small legs and used a stretched piece of skin as a wing. If the whole cross-section of dinosaurs’ life is compared with today’s life then it is clear all land based life was shifted towards a larger scale during the dinosaurs’ time. This larger scale of life is explained by a reduced gravity on the ancient Earth.